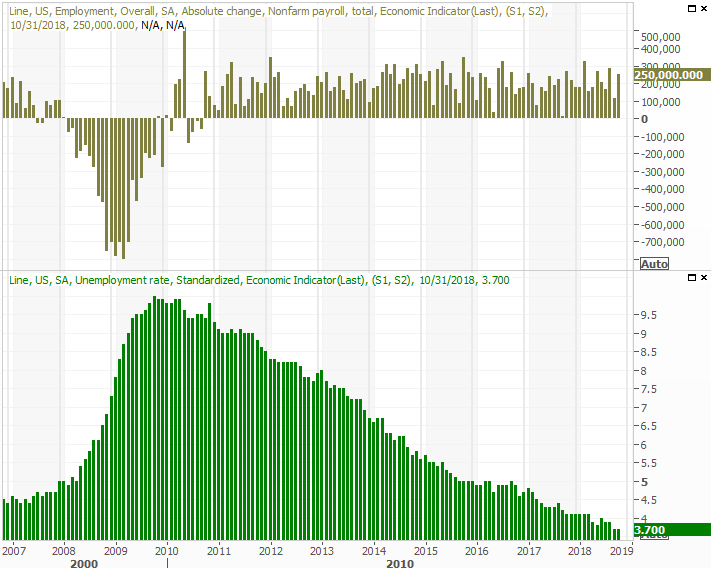 If there was any doubt that the United States' jobs market has running into a headwind, it was wiped away on Friday. 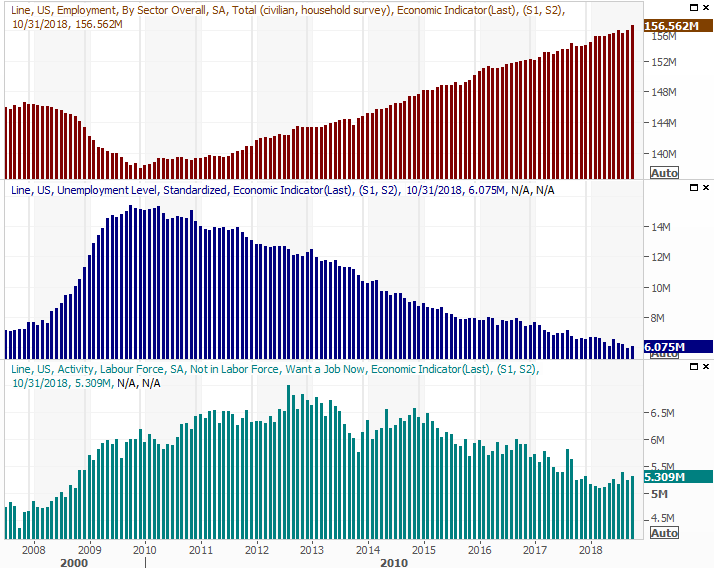 On the heels of an unexpectedly strong 250,000 new payrolls (versus estimates of 190,000), the unemployment rate remained at a multi-decade low of 3.7%. And, that was the least compelling piece of the October jobs report. Most of the time, the touted numbers - the unemployment rate and the raw number of net new hires - are enough to make a judgment call on this aspect of the economy. In the current scenario though, that's not exactly the case. It hasn't been for a while. Most people who've wanted a job since 2012 have been able to get and keep a job. But, it's not been a particularly well-paying job, or an employment opportunity that worker's been thrilled with. Those things have been changing in earnest since early this year though, but without crimping other key measures; there's not been the usual trade-off. 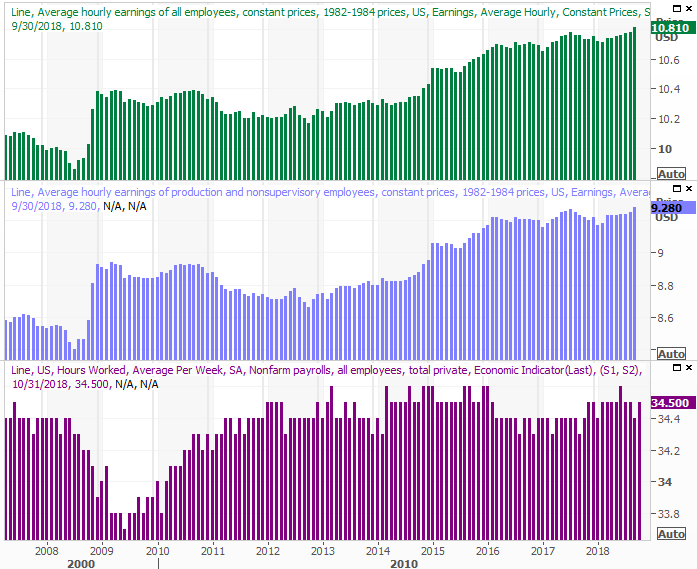 Where the true strength of the jobs market really shines through, however, is with other measures like the portion of the population that's employed, and the portion of the population that at least considers themselves part of the workforce... employed or otherwise. The employment/population ratio ticked higher last month, reaching a multi-year high of 60.6% and rekindling a long-term uptrend that looked like it might be stalling. The civilian labor force participation rate - the number of people who are joining or re-joining the workforce - edged back up to 62.9%. That's more or less in line with highs seen since the beginning of 2016, affirming the interest and hope in being an employee. In some ways the graphic above is counterintuitive. The two figures should more or less be moving in tandem. The mass retirement at least partially explains the suppress labor force participation rate, but that begs the question... how is a bigger portion of the population securing employment when a huge portion of the population is leaving the workplace and retiring? The answer is, as always, somewhere in the middle. The image below fleshes out the idea a little better. From the top down, we can see there are now a record-breaking 156.56 million people with jobs. But, the number of people that are officially unemployed actually ticked up a bit, to 6.07 million. The bigger trend is still pointed lower, but the occasional bump up actually reflects a little bit of a headwind. At the bottom of the chart above is some truly telling data - the number of people who are unemployed and not receiving unemployment benefits, and are therefore not being counted as unemployed. But, they'd still like to re-enter the workplace anyway. Their renewed interest is a tacit sign of optimism. The good news is, the jobs are there waiting for them. In the most recent job openings report (from August), available positions reached a record high of 7.14 million. It's pretty much impossible to say the labor market isn't great. And, given that the U.S. economy is two-thirds consumer driven, it's difficult to suggest economic growth (and therefore corporate earnings growth) isn't in the cards.